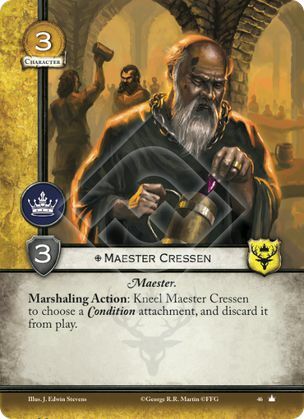 Beginning this series (described in detail here: https://www.agot.cards/2019/01/23/austere-assembly-hub-article/) we have House Baratheon. Bara are in a weird place with regards to a core deck, insofar as most of their more successful decks being those that ‘stick out’ more due to their regular gameplan being weak. Despite this, I’ll be looking at focusing on a more standard Bara build. Despite what cynics might say, it won’t be weak forever as the meta inevitably moves on, so let’s assume the GoodStuff build comes into prominence at some point. To that end I present to you the Bara Necessities. 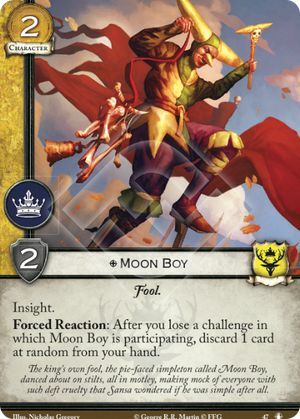 Moon Boy House Baratheon Character Plot deck limit: 3. Fool. Insight. 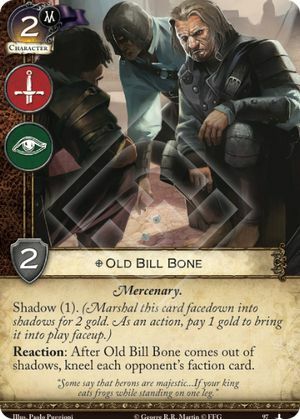 Old Bill Bone Neutral Character Plot deck limit: 3. Mercenary. Shadow (1). Poor Fellows Neutral Character Plot deck limit: 3. Army. The Seven. No attachments. Robert Baratheon (Core) House Baratheon Character Plot deck limit: 3. King. Lord. Intimidate. Renown. 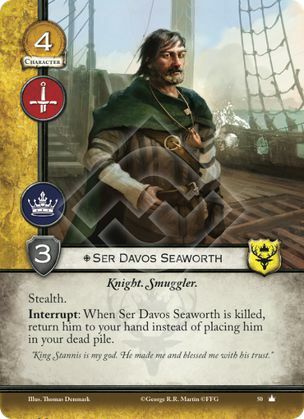 Ser Davos Seaworth (Core) House Baratheon Character Plot deck limit: 3. Knight. Smuggler. Stealth. 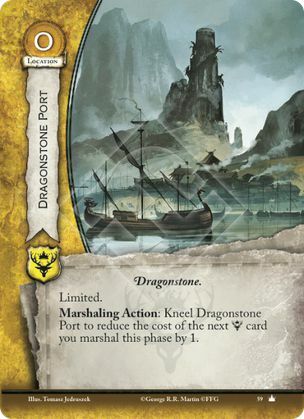 Dragonstone Port House Baratheon Location Plot deck limit: 3. Dragonstone. Limited. 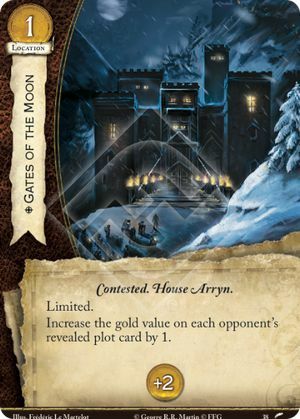 Gates of the Moon Neutral Location Plot deck limit: 3. Contested. House Arryn. Limited. 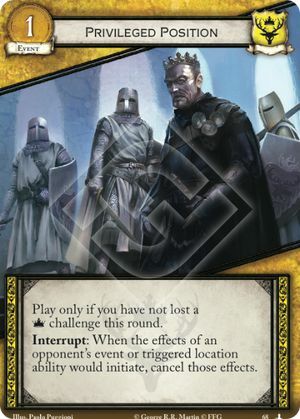 Increase the gold value on each opponent’s revealed plot card by 1. 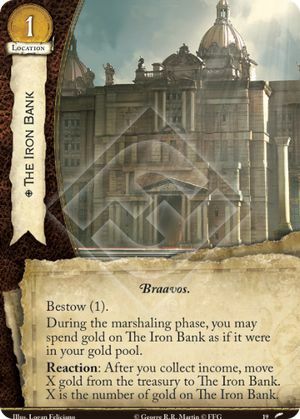 The Iron Bank Neutral Location Plot deck limit: 3. Braavos. Bestow (1). The Red Keep House Baratheon Location Plot deck limit: 3. King's Landing. 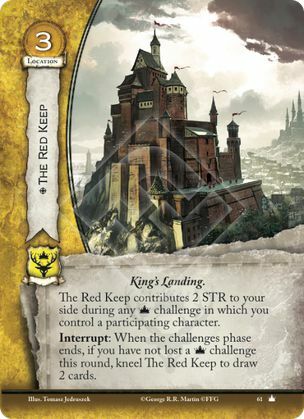 The Red Keep contributes 2 STR to your side during any challenge in which you control a participating character. 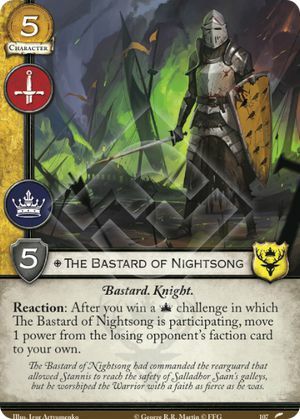 This list is driven by three main things Baratheon lacks: strong draw; strong economy; and strong cheap characters. 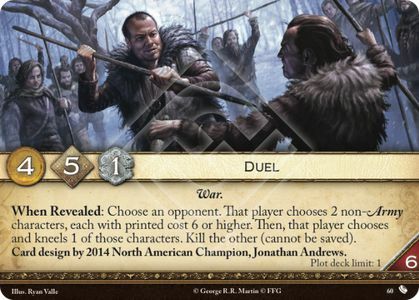 Not all lists will be so neutral-heavy or so core-heavy, but the Baratheon cardpool is what it is so here we are. 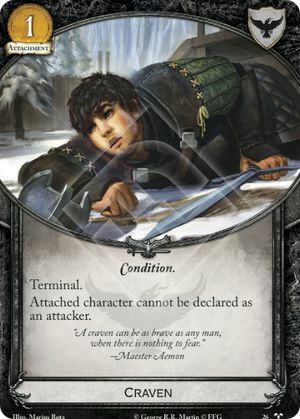 Ser Justin Massey House Baratheon Character Plot deck limit: 3. Knight. 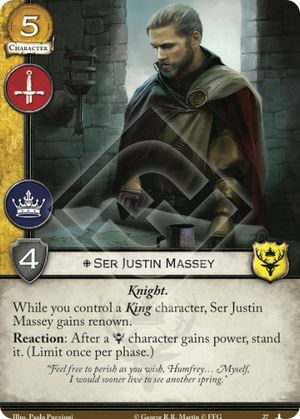 While you control a King character, Ser Justin Massey gains renown. 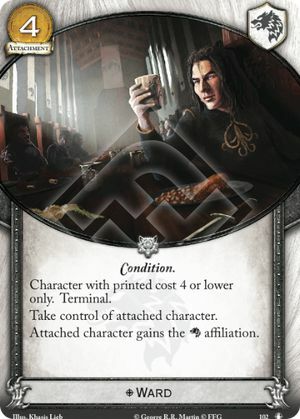 Littlefinger (Core) Neutral Character Plot deck limit: 3. Ally. Lord. Small Council. 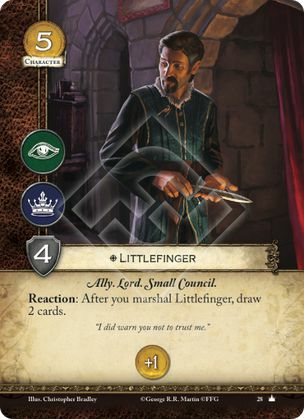 Reaction: After you marshal Littlefinger, draw 2 cards. +1 Income. Core Set #28 ; where another may want any combination of those cards. Therefore, including all of them in the core felt wrong to me. 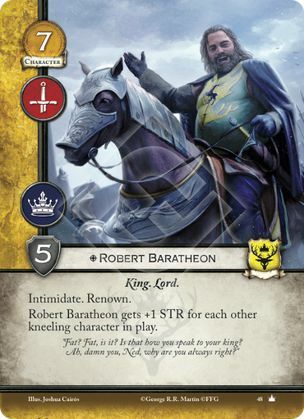 However, what Baratheon do not have a lot of is good characters in the 2g cost slot. As a result, I’ve had to import more neutral characters into this list than I normally would be comfortable with. 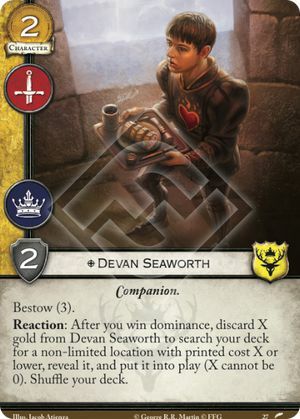 Devan Seaworth House Baratheon Character Plot deck limit: 3. Companion. Bestow (3). 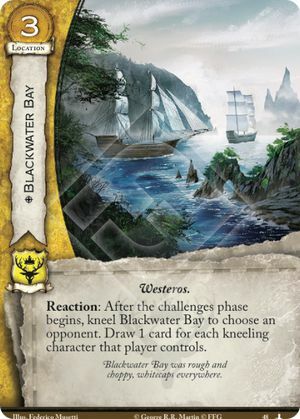 Stormlands Fiefdom House Baratheon Location Plot deck limit: 3. Westeros. 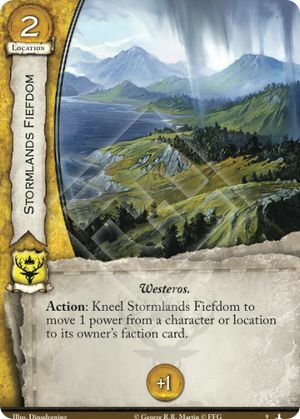 Action: Kneel Stormlands Fiefdom to move 1 power from a character or location to its owner’s faction card. +1 Income. The Shadow City #9 s, making the choice to give them power instead a much tougher one for your opponent. 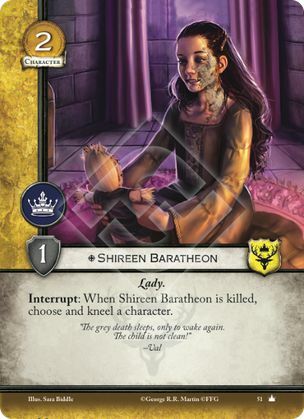 Shireen Baratheon (MoD) House Baratheon Character Plot deck limit: 3. Lady. Shadow (3). 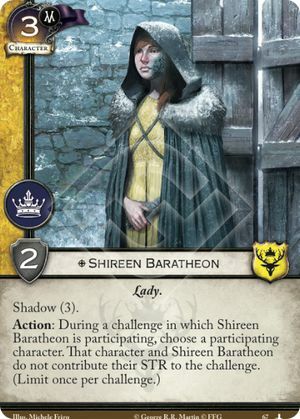 Action: During a challenge in which Shireen Baratheon is participating, choose a participating character. That character and Shireen Baratheon do not contribute their STR to the challenge. (Limit once per challenge.) Music of Dragons #67 , and she’s been making serious waves among the Bara loyalists. 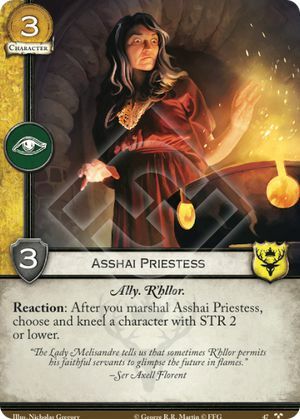 Ultimately I decided to keep the original in here due mostly to her being cheaper (as well as an easier card to ‘get’ if you are a less experience competitive player), but this is the card I would add the most caveats to – if you are running icon-granting effects, go with the other Shireen; if your deck is predominantly built around the power challenge, go with the other Shireen; if you are running enough economy to support a more expensive card, at least strongly consider the other Shireen. If you are Adem, play the other Shireen. Ward House Stark Attachment Plot deck limit: 3. Condition. Character with printed cost 4 or lower only. Terminal. Milk of the Poppy Neutral Attachment Plot deck limit: 3. Condition. Terminal. 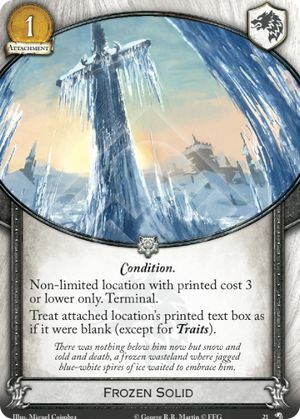 Craven The Night's Watch Attachment Plot deck limit: 3. Condition. Terminal. Frozen Solid House Stark Attachment Plot deck limit: 3. Condition. Non-limited location with printed cost 3 or lower only. Terminal. 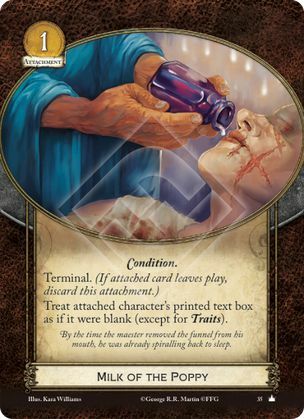 Treat attached location’s printed text box as if it were blank (except for Traits). Wolves of the North #21 and more – all having the Condition trait. You may well want more than one copy of him, but everyone should be running that first one at least. Ser Davos Seaworth is one of only two of Bara’s several efficient mid-range characters I deemed mandatory, simply because he fits so many different styles of play. If you’re running a low curve, his stealth is excellent for opening up routes past the opponent’s big characters; if you’re going Knights, he has the trait; if you’re playing a mid-range control list, he will stick around through pretty much all resets; he’s just a complete character. The other, Ser Cortnay Penrose, is less ‘complete’ than Davos, but is just really, really efficient. 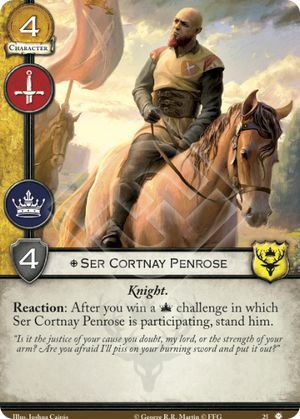 He helps you win power challenges on attack and defence, something Baratheon wants to do, with no loss of tempo. He also has reasonable stats for his cost and an occasionally-important Knight trait. 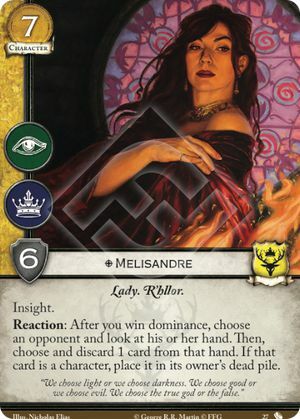 Melisandre (GtR) House Baratheon Character Plot deck limit: 3. Lady. R'hllor. Insight. Reaction: After you win dominance, choose an opponent and look at his or her hand. Then, choose and discard 1 card from that hand. If that card is a character, place it in its owner’s dead pile. Guarding the Realm #27 , you’re not running the core version. Duel Neutral Plot Income: 4. Initiative: 5. Claim: 1. Reserve: 6. Plot deck limit: 1. War. When Revealed: Choose an opponent. That player chooses 2 non-Army characters, each with printed cost 6 or higher. Then, that player chooses and kneels 1 of those characters. Kill the other (cannot be saved). The Fall of Astapor #60 . Moving onto locations, and again we have gold and draw. 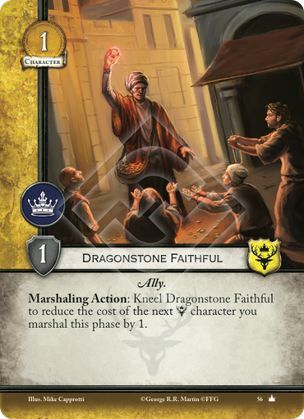 As with the Dragonstone Faithfuls, I won’t always highlight the 3x 0g limited – but with one of the weakest 2g limited econ cards and one of the weakest 2g non-limited econ cards, what choice do Bara really have? Similarly I won’t always recommend Gates of the Moon, and definitely won’t always recommend The Iron Bank, but for Baratheon right now I feel they’re necessary. 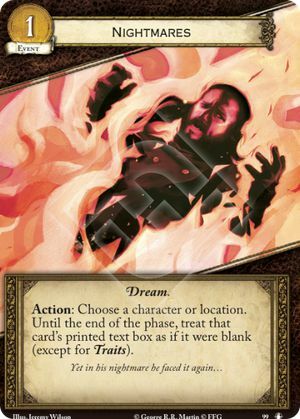 I personally like to run 3x Iron Bank, but I think even if you don’t want to rely on it you should run at least 1 in my opinion – this is a card some people dislike and some people love, and while I fall somewhere in the middle, the upside is very strong for a deck that predominantly relies on relatively expensive (or at least overpriced) characters and effects..
King at the Wall House Baratheon Attachment Plot deck limit: 3. Title. Unique character only. Reaction: After you win a challenge in which attached character is participating, draw 1 card for each out-of-faction location you control. Someone Always Tells #108 , amongst others) its importance has dropped off. Despite that, it’s well worth the inclusion at 1x still. It forces your opponent to make a challenge they might otherwise not necessarily want to make; it helps you win power challenges on both attack and defence; and it can draw you cards round after round for no effort on your part. 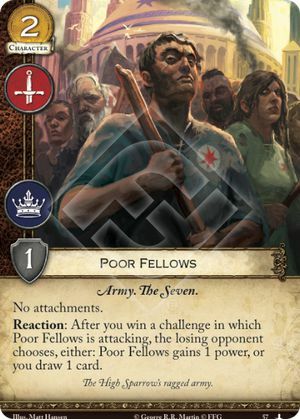 Baratheon of course have other good locations available to them that you should consider, particularly if you are running a dominance- or kneel-based gameplan. However, as some decks may run one or the other, or both, or neither, they are left out here. Privileged Position House Baratheon Event Plot deck limit: 3. Play only if you have not lost a challenge this round. Seen In Flames House Baratheon Event Plot deck limit: 3. R'hllor. 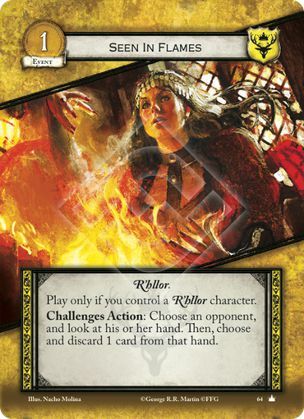 Play only if you control a R’hllor character. Challenges Action: Choose an opponent, and look at his or her hand. Then, choose and discard 1 card from that hand. Core Set #64 , which doesn’t cancel events but can pull them from an opponent’s hand before they ever get the chance to play them. 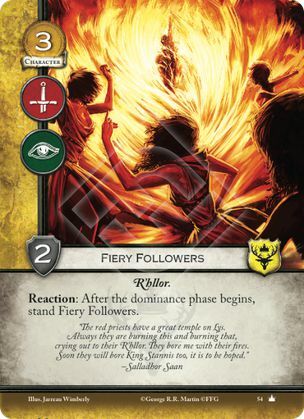 Seen in Flames is an absolutely outstanding card, and the only reason it’s not 3x in this list is that you won’t necessarily include a R’hllor package. 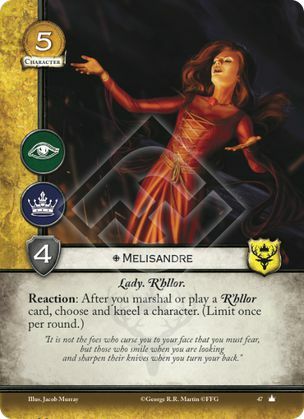 However, if you do include a R’hllor package, Seen in Flames isn’t only a 3x, but is probably the reason you’re doing so in the first place, even more than Core Mel is. So while neither Privileged Position nor Seen in Flames are going to consistently go in every single Bara deck, between them they certainly mean Hand’s Judgement won’t either. So there we have my list of every card I think Baratheon need to run right now, regardless of their deck. Agree, disagree? Have cards you strongly believe should be added to this list or removed from it? Please let me know below – this is obviously a series that will be prone to being hotly debated, and I relish the opportunity to hear the views of the community. @Odrl I just want to say how great it is to see an in depth response like this here. 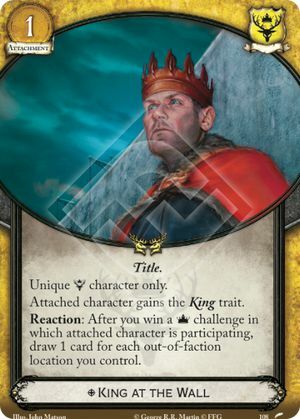 That and I agree that Privileged Position is really great and a strong contender for a card to always include in Baratheon. Thanks for the articles, I think they are great. I’m surprised the Painted Table and Iron Throne aren’t included. The power gain/drain is significant and the investment isn’t much if you don’t tilt your deck all in to win dominance. Could you explain your reasoning?